The Indian Government has proposed an update to the Cinematograph Act to target camcording piracy. Under the new proposal, pirates will face up to three years in prison. The new plans follow repeated calls from the local movie industry, Hollywood, as well as the US Government. Ten years ago India only had about five million broadband subscribers. Today, there are close to half a billion. This massive increase has left its mark on society, and as we envisioned at the time, it proved to be a growth market for pirates as well. The high online piracy rates are a problem, but offline there are issues too. As it turns out, many of the camcorded movie leaks that appear on pirate sites originate from Indian movie theaters. This presents a problem for both Bollywood and Hollywood, both of which have repeatedly argued that current copyright legislation is not properly equipped to deal with the problem. “The Indian Government should swiftly enact legislative amendments to outlaw unauthorized recording of all or part of an audiovisual work in a cinema,” MPAA noted just recently. The US Trade Representative also highlighted this issue in its most recent Special 301 Report, noting that proposed amendments to the Cinematograph Act have stalled for several years. 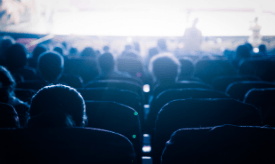 Whether this outside pressure had an effect or not, the Indian Government is now proposing a new amendment to the Cinematograph Act to target unauthorized copying in theaters. As a result, camcording pirates may soon face jail time and hefty fines. The proposal suggests putting a maximum prison sentence of three years on unauthorized recording audio or video footage at a movie theater. In addition, there’s a maximum fine of Rs.10 Lakhs, which is roughly $14,000. The draft legislation has yet to pass but major players in the movie industry are happy with the announcement. Uday Singh, managing director of the MPA’s Motion Picture Distributors Association (MPAA-India), says that the camcording amendment will put India on par with other countries that already have similar measures. “Most countries in the world either have a law or some kind of a provision that covers camcording. It is a welcome move. We used to see a lot of leaks in the supply chain in this area. I think that this is one more step towards plugging that leak,” Singh notes, quoted by Television Post. While there is not yet a fully-fledged anti-camcording law, there hasn’t been a shortage of arrests. Indian law enforcement has taken steps against unauthorized recording in theaters on several occasions. This even led to the arrests of several, presumably innocent, theater owners. The Indian Film Exhibitors Association recently called on the Madras High Court to put a halt to these overbroad crackdowns.